Its been a funny day to day and I haven't actually finished anything on my craft table and tomorrow we have visitors for lunch. I am going to meet the a future daughter in law. Have to admit to being a little nervous. 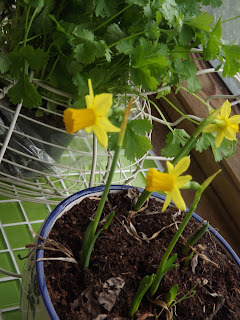 The Christmas before last my friend gave me a lovely bowl of mini daffodil bulbs and the soil - a kit type thing. But it was so ong after Christmas when we met up they didn't do very much. After they had grown 2 " and flowered I put the pot into the greenhouse and never gave it another thought. 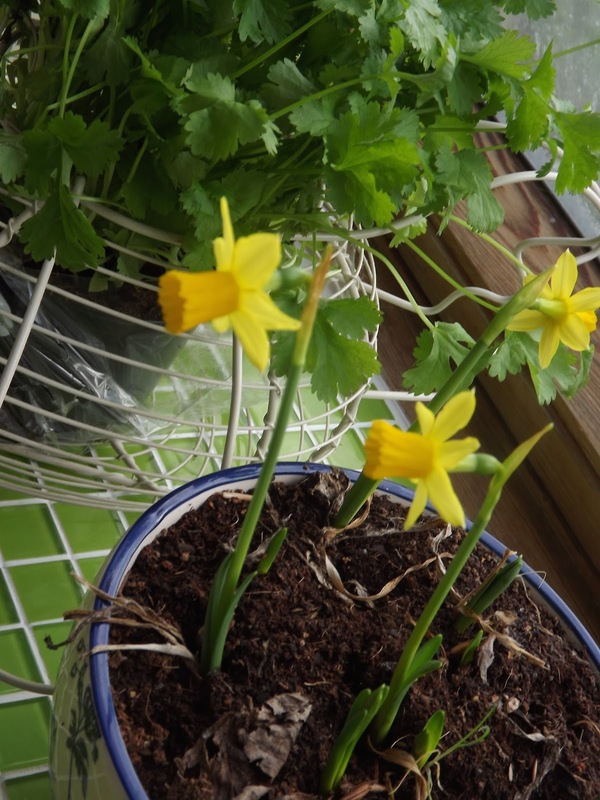 Some weeks ago when I was thinking about seeds for the coming season I decided to bring the bowl into the kitchen window sill which is a very sunny spot and hey presto I have a delight full bowl of green shoots and the first couple of flowers have opened.